Is the hysteria about health insurance covering #pre-existing medical conditions #FakeNews? ACA changed the health insurance industry from individual rating to community rating. This is a chief reason premiums have doubled since 2010. With individual rating, a healthy non-smoker pays less than someone that is an unhealthy smoker with cancer; rightfully so. With community rating under ACA, everyone’s insurance costs go up because the unhealthy smokers are often not paying a rate proportionate to the costs they are likely to impose on the system; unfair from a self maintenance perspective. Although ACA purportedly allows the imposition of a “smoker’s penalty” it is not required and a number of states (including California and New York) prohibit higher rates for smokers. Then came the liberal social justice argument of what shall we do with those that are unhealthy smokers with cancer? The answer that had worked previously to Obamacare were risk pools. People with risk, just like bad drivers with extensive crashes, were assigned to companies to except the risk. ACA Obamacare did away with the risk pools and now everyone is considered a high risk and expensive. From the quality and price perspective, it seems fair to charge everybody the same. From the perspective of self-respect and taking care of oneself, it is completely unfair to rate people in this way. The latest hysteria on pre-existing insurance coverage is indeed a political strawman argument, not a real issue..
DPC physicians and patients take note! Alexander-Murray will allow anyone to have a “catastrophic plan” as such plan is defined by ACA. ACA limits enrollment in these plans to enrollees under 30 years of age or enrollees who have a waiver. Alexander-Murray would do away with these limitations. So far so good. This will harmful to patients of DPC practices and is bad policy. It essentially forces primary care to be handled in-network — great for the insurance companies but not for the patients orthe doctors. The AMA is utter garbage. But, you knew that. Here they go again. 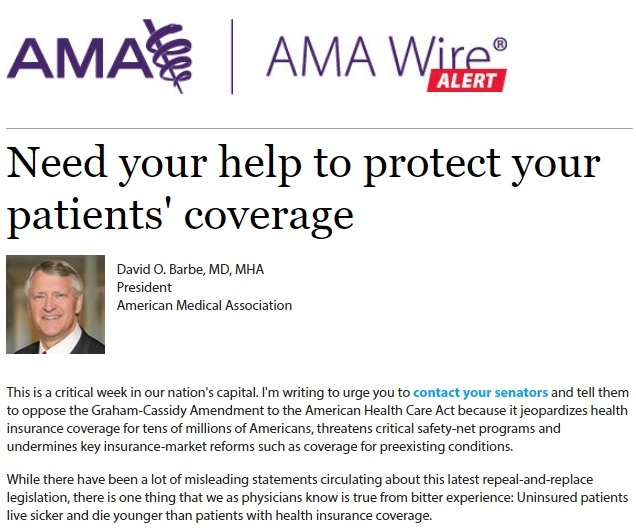 Once again the AMA is promoting what’s best for the big government / big insurance / big hospital cartel instead of advocating solutions that will truly empower patients, physicians, and increase access to high-quality, low-cost care. How can we motivate Congress to act on ACA? End their illegal exemption! For the Senate to pass ObamaCare repeal and replace with only 51 votes, they’ll need to take action by September 30th. How can we motivate Congress to act? By President Donald J. Trump ending Congress’ illegal exemption from ObamaCare.